(Nanowerk News) New types of membrane adsorbers remove unwanted particles from water and also, at the same time, dissolved substances such as the hormonally active bis-phenol A or toxic lead. To do this, researchers at the Fraunhofer Institute for Interfacial Engineering and Biotechnology IGB imbed selective adsorber particles in filtration membranes. Activated carbon or adsorber materials are already used to remove chemicals, anti-biotics or heavy metals from waste or process water. However, a disadvantage of these highly porous materials is the long contact time that the pollutants require to diffuse into the pores. So that as many of the harmful substances as possible are captured even in a shorter time, the treatment plants use larger quantities of adsorbers in correspondingly large treatment basins. However, activated carbon can only be regenerated with a high energy input, resulting for the most part in the need to dispose of large quantities of material contaminated with pollutants. Researchers at the Fraunhofer Institute for Interfacial Engineering and Biotechnology IGB in Stuttgart have opted for a new approach that combines the advantages of both methods. When manufacturing the membranes they add small, polymeric adsorber particles. 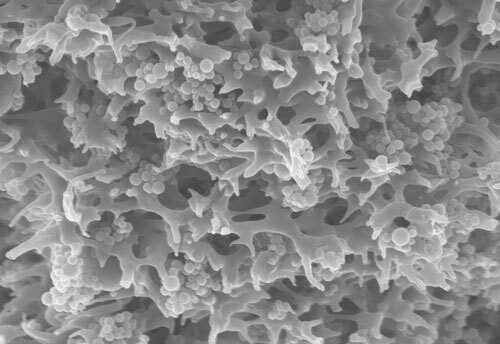 The resulting membrane adsorbers can – in addition to their filtration function – adsorptively bind substances dissolved in water ("Nanostructured Composite Adsorber Membranes for the Reduction of Trace Substances in Water: The Example of Bisphenol A"). “We make use of the porous structure of the membrane located underneath the separation layer. The pores have a highly specific surface so that as many particles as possible can be imbedded, and they also provide optimum accessibility,” says Dr. Thomas Schiestel, Head of the “Inorganic Interfaces and Membranes” working group at the Fraunhofer IGB.